Novosibirsk scientific centre is known over the world scientific community for the mathematical schools. Academician Sergey Lvovich Sobolev is one of the greatest mathematicians of the 20th century, who made the fundamental contribution to the modern science, was one of the founders of the Siberian Branch of AS USSR. 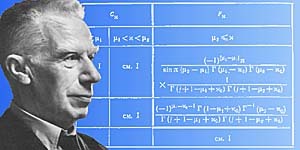 He has created new branches of mathematics, and he has introduced essentially new objects into mathematical apparatus, has developed the powerful research methods, which allowed a series of the challenging problems to be solved that were for a long time impossible to be analysed. S.L.Sobolev has played the major part in shaping of the new scientific schools in our country and abroad, in a formative stage and development of some directions of an applied mathematics. It is impossible to overestimate Sergey Lvovich's role in shaping the Siberian mathematical school. The founder of the Institute of mathematics of the Siberian Branch and its director for a quarter of century, S.L.Sobolev has made a decisive contribution to the defining of scientific destiny of an Institute, which is now named after him. Updated: Wed Feb 27 14:46:46 2019. Size: 5,739 bytes.